The Flare [Review] — Is this "warmest shirt" really worth it? The Flare is a type of smart shirt developed by BLANC. It’s designed to keep you warm enough that you won’t have to wear extra layers, yet, not causing you to overheat. It does this by containing a battery powered, adjustable heating system. And, if you do sweat, the fabric is moisture wicking and designed to keep sweat out and heat in. But, for all its claims and seemingly extraordinary features, there are also a lot of flaws in the product, as well. Review of The Cons – Is it really worth-a-buy? The battery that the shirt relies on to keep you warm doesn’t last long and will need frequent charging. It can be used on the low setting for five hours, the medium setting for 3.5 hours, and the high setting for two hours. So, it’s not really a great way to stay warm throughout a work shift if you work outside. It’s not a good idea to depend on the Flare for any situation in which you’ll be in the cold for more than two or three hours. I would rather have you hook out for this one, a better and slightly cheaper option. There’s one pocket on the shirt, which you would think would be handy and useful. However, it’s rather small. They say it will hold anything the size of an iPhone 7. But, the major problem with the pocket is that it’s in the back, not the front. So, if you have muscular mobility issues, it could be really difficult to get into it. And, if you put on a coat over top of the shirt, it’s going to be covered up and pretty inaccessible, which defeats the purpose of having a convenient pocket on a shirt. Maybe don’t wear the Flare shirt to the airport. The company says that you can get it on a plane because the FAA requires that battery packs be under 100-watt hours, and theirs comes in at only 30-watt hours. But, you definitely shouldn’t wear it through security checkpoints. There’s metal in it, so it will have to be removed and ran through scanners and such. And, the company doesn’t give backers any solution to this problem. So, who knows if it will work after being put through the scanners and such at the airport? And who would want to deal with the hassle? There is apparently a limited number of the Flare shirts that are available as rewards. The $99 super early bird deal is already sold out. So, you’ll now have to pay between $129-$149 for one. Or, you still have the ability to buy multipacks. Also, if you’re looking forward to buying and using the Flare shirt this winter, you’re out of luck. They’re not scheduled to be delivered until March next year. By then, it will probably be warm enough that you won’t need to use it much, if at all. So, you’ll have to buy it and then put it back until Winter 2019. There’s only one color choice, and it’s a heathered black. If you don’t like that color, you’re going to either have to just deal with it or wait. Backers have asked for other colors and suggested them for flex goals. But the company says that currently, they aren’t working on other colors. They do say that if they come out with other colors, they’ll let backers know, but it doesn’t sound promising. Although the Flare is a good idea, it’s not a thoroughly fleshed out thought or product. It seems like it’s worth waiting until the campaign is over to see what the backers say in their reviews about the product. 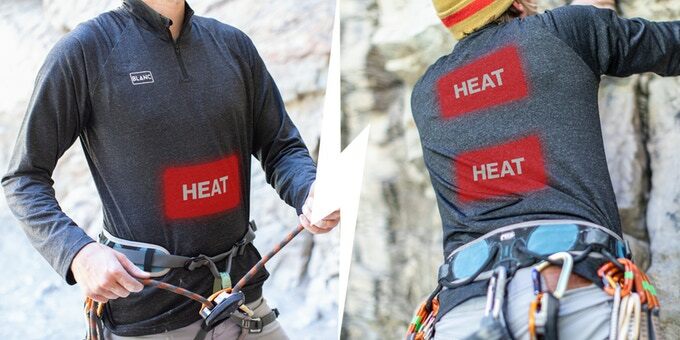 But, if you can’t wait until next winter to own a smart shirt, there are plenty of other ones like this one on the market that have other features, and they might be worth looking into. The World's Warmest Shirt by Blanc! This campaign is now funding on Kickstarter until Sun, December 2 2018. Overall, this battery-powered shirt is kinda worth a try if you don't mind paying a little more.